For everyone who loves Trestles and San Mateo Creek, it's always gratifying to see the creek running back into the Pacific after taking a few seasons off. These latest El Nino storms dumped lots of rain in Southern California, bringing trash and polluted water to many beaches. But at Trestles, the clean San Mateo runs clear and strong thanks to the lack of development throughout the watershed. When it rains this hard, the beach is also replenished with huge volumes of sand and cobbles pouring out of the Creek. And be sure to watch for Steelhead heading back up to their spawning grounds in the upper reaches of the San Mateo. 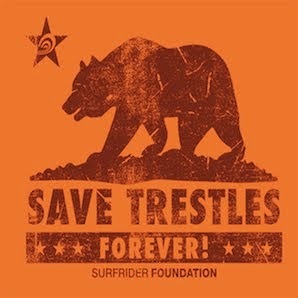 I loved surfing @ Trestles in the 60's and 70's when I was attending Irvine and living in Newport Beach. We had to sneak in in those days but it was always worth it. Good to see that its still happening. Maybe, they should make all of So. cal. a restricted marine base it might clean up the scene a bit. Send everyone to Idaho for a few yrs.